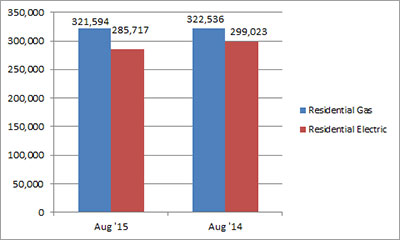 U.S. shipments of residential gas storage water heaters for August 2015 decreased 0.3 percent to 321,594 units, down from 322,536 units shipped in August 2014. 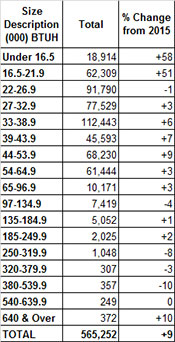 Residential electric storage water heater shipments decreased 4.4 percent in August 2015 to 285,717 units, down from 299,023 units shipped in August 2014. For the year-to-date, U.S. shipments of residential gas storage water heaters increased 6.6 percent to 3,105,321, compared to 2,913,876 units shipped during the same period in 2014. 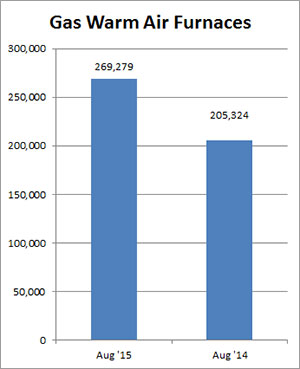 Residential electric storage water heater shipments increased 3.3 percent year-to-date to 2,865,703 units, compared to 2,773,935 units shipped during the same period in 2014. 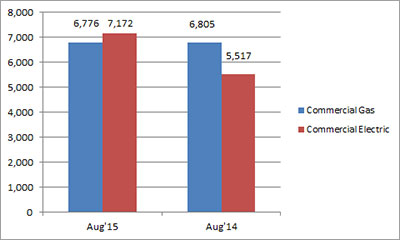 Commercial gas storage water heater shipments decreased 0.4 percent in August 2015 to 6,776 units, down from 6,805 units shipped in August 2014. Commercial electric storage water heater shipments increased 30.0 percent in August 2015 to 7,172 units, up from 5,517 units shipped in August 2014. Year-to-date U.S. shipments of commercial gas storage water heaters increased 5.0 percent to 66,847 units, compared with 63,646 units shipped during the same period in 2014. Year-to-date commercial electric storage water heater shipments increased 15.1 percent to 56,904 units, up from 49,418 units shipped during the same period in 2014. 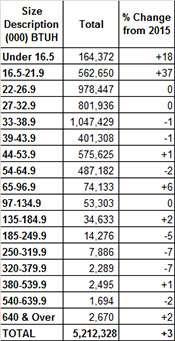 U.S. shipments of gas warm air furnaces for August 2015 increased 31.1 percent to 269,279 units, up from 205,324 units shipped in August 2014. 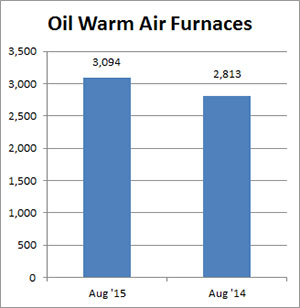 Oil warm air furnace shipments increased 10.0 percent to 3,094 units in August 2015, up from 2,813 units shipped in August 2014. Year-to-date U.S. shipments of gas warm air furnaces increased 4.9 percent to 1,712,258 units, compared with 1,631,750 units shipped during the same period in 2014. Year-to-date U.S. shipments of oil warm air furnaces increased 12.0 percent to 19,101, compared with 17,050 units shipped during the same period in 2014. 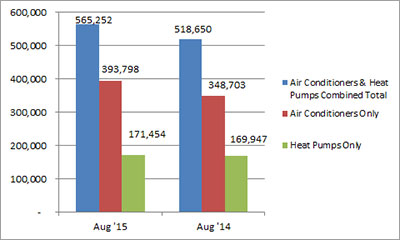 U.S. shipments of central air conditioners and air-source heat pumps totaled 565,252 units in August 2015, up 9.0 percent from 518,650 units shipped in August 2014. U.S. shipments of air conditioners increased 12.9 percent to 393,798 units, up from 348,703 units shipped in August 2014. U.S. shipments of air-source heat pumps increased 0.9 percent to 171,454 units, up from 169,947 units shipped in August 2014. Year-to-date combined shipments of central air conditioners and air-source heat pumps increased 3.0 percent, to 5,212,328 units, up from 5,060,065 units shipped in August 2014. Year-to-date shipments of central air conditioners increased 3.7 percent to 3,489,113 units, up from 3,365,101 units shipped during the same period in 2014. The year-to-date total for heat pump shipments increased 1.7 percent to 1,723,215 units, up from 1,694,964 units shipped during the same period in 2014.